Discover Orlando through date nights without breaking the bank. The City Beautiful boasts plenty of free and/or cheap options for lovers on a budget. Our 2017 low-budget bucket list will ensure priceless date adventures! So, make 2017 the year to tackle your Orlando-area bucket list. 1. Attend “Orlando’s original art party” at the Orlando Museum of Art with 1st Thursday’s, held monthly for $10 with showcases of local artists, live music, cash bars and café munchies. 2. Wine Walks: On 2nd Thursday of every month, gather with Orlandoans for the Thornton 2nd Thursday Wine + Art Walk to celebrate community, art and the eclectic charm of this neighborhood. $15 (cash only) gets you a glass and a map of over 25 businesses offering tastings, plus live music, art vendors and more. Also, check out the Sanford Art Walk and Baldwin Park First Friday Festival. Or, participate in the free Gallery Hop, hosted by the Downtown Arts District, featuring numerous galleries and non-traditional art venues that spotlight the best of established and emerging Orlando-based artists in tandem with nationally and internationally acclaimed artists. 3. Roam free art galleries: Visit the intimate Mennello Museum of American Art on the 2nd Sunday of the month for free admission. Then picnic by “The Mayor,” a 350-year-plus sprawling oak draped with Spanish moss by Lake Formosa. Or, grab a drink at the Bösendorfer Lounge at the Grand Bohemian and tour the Grand Bohemian Gallery ─ you don’t have to be a hotel guest to tour – to find oil paintings, glass, wood, contemporary jewelry and bronze sculptures. And remember to take advantage of The Museum Day Live hosted by Smithsonian magazine, September 2017 date TBA, for free admission to area museums and cultural institutions, such as the Orange County Regional History Museum and The Albin Polasek Museum & Sculpture Garden. 4. Tune into the free Indie Folk Fest on February 11, 2017 at the Mennello Museum of Art. Spend a sweetheart of an afternoon on a comfy picnic blanket in the sculpture garden drinking up art, music, food and beverage. 5. Lakeridge Winery hosts awesome events throughout the year but the “stomping” events remain our favorites! You’ll have a barrel of fun stomping grapes at both the 27th Annual Harvest Fest on June 9-11 and the 23rd Annual Grape Stomp on August 19 & 20. Entry to these events is just a $2 donation to benefit charities. 6. Add a little culture to your date night calendar with free community events by the Bach Festival Society. The Bach Festival Society of Winter Park has the distinction of being the third-oldest continuously operating Bach Festival in the United States, as well as being Central Florida’s oldest operating performing arts organization. 7. 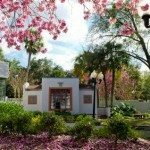 Discover “Festival City,” also known as the quaint town of Mount Dora. Check out the Arts Festival (February), Dragon Boat Races (April), Blueberry Festival (April) and many more. 8. A $5 general admission fee will get you into the Chili Cook-off at Orlando Festival Park on February 18, 2017 for tasty samples, live bands, the World Chili Eating Challenge and more. 9. The Winter Park Sidewalk Art Festival is one of the nation’s oldest, largest and most prestigious juried outdoor art festivals, consistently rated among the top shows by Sunshine Artist and American Style magazines. This event makes for a masterpiece freebie date. 10. The Florida Citrus Parade is one of the largest sports-affiliated parades in the nation and an annual tradition that occurs each year between the bowl games. It’s a fun time to see impressive performers and the likes march down Orange Avenue. 11. Opa! With $3 admission to Orlando Greek Fest (Nov. 3-5, 2017), you can enjoy authentic Greek food, dancing, live music, church tours, iconography presentations and much more. 12. Roam the streets of the picture-perfect town of Celebration lined with quaint boutiques, restaurants, a lake and glorious homes. The community, conceived by Disney, hosts various free festivals including Now Snowing, Oktoberfest and more. 13. Flip pancakes at the Old Spanish Sugar Mill, a restaurant beside De Leon Springs with griddle-equipped tables. For just $4.95, you can feast on ALL YOU CAN EAT flap jacks served with raw honey, syrup and unsulphured molasses. After carb-loading, explore the 625-acre state park ($6 per vehicle), inclusive of Native American burial mounds and a 6,000-year-old sunken canoe. Hike 4.2 miles on the Wild Persimmon Hiking Trail or stroll the 1/2 mile paved Nature Trail to discover a 600-year-old cypress tree and the Butterfly Garden filled with about 500 plants, hummingbirds and, of course, butterflies. 14. Catch a free flamenco show at Ceviche in Downtown Orlando. We recommend noshing on tapas ($4 and up). 15. And also catch a free Irish jig and musical performance at Raglan Road at Disney Springs. 16. Take a Beer Yoga class… yup, downward dog followed by a down-the-hatch brew. Find classes for $10 at both Orlando Brewing Company and Crooked Can Brewery (Winter Garden). 17. Stop into Showcase of Citrus for a free and truly unique wine tasting featuring specialty Florida-made tropical, citrus and berry selections. Sounds like an odd place for tastings, but your palate will be pleasantly surprised. Of course, we still love Quantum Leap Winery and Orlando’s other great wine spots. 18. Harry P. Leu Gardens, a 50-acre botanical haven, offers a variety of attractions, including a butterfly garden, bamboo and palm gardens, a house museum dating to the 1880s and various seasonal events. Free admission to the park is available on the first Monday of the month. 19. Popcorn Flicks in the Park: Enjoy movies outdoors without charge throughout Greater Orlando. 20. Go to Holy Land for free. The religious theme park offers one free day a year to qualify under state law for property-tax exemption as a religious entity. You’ll save up to $50 per person. 21. Dive into the hilarious fun of the Annual Cardboard Canoe Regatta as you watch brave ‘pirates’ and ‘boat artists’ race down the spring run at Kelly Park in cardboard and duct tape vessels! 22. Pave the way to adventurous dates. Orlando has 23 bike trail options ─ all within a 30 mile radius of downtown ─ that collectively total over 150 miles of paved, off-street biking. Full speed ahead on the West Orange Trail, Cady Way Trail, Little Big Econ State Forest, etc. 23. Visit Lake Eola to see Orlando’s iconic foundation, shop the farmer’s market, practice yoga in the park and to ride on a swan paddle boat. Each boat holds 5 people and costs $15. Perhaps get some liquid courage first with a lakeside brew at World of Beer. 24. Take a free nature hike. Try the Nature Conservancy’s Disney Wilderness Preserve (Kissimmee), Oakland Nature Preserve (just west of Winter Garden) or Lake Lotus (Altamonte Springs). 25. Watch the sea cows! Blue Spring is the largest spring on the St. John’s River, the longest river in Florida, spewing 104 million gallons of water every day. The stunning 73°F waterway is famous for its population of manatees that migrate south during the winter to bathe in warm locales. Watch the mellow sea cows from walking paths and viewing areas. 26. Be a beach bum… inland! Dinky Dock is a 1.56-acre park open from 8am until dusk and offers a fishing pier and boat ramp. This spot is perfect for a beach picnic date. 27. Watch Disappearing Island come and go. During low tide every day, an island appears as the water recedes at the inlet where Ponce Inlet and New Smyrna almost meet creating a temporary recreational playground for boaters. 28. Get spooked at Spook Hill where cars inexplicably defy the laws of science by rolling uphill! 29. Bring your ‘A’ game to Artegon Marketplace every Tuesday for #TournamentTuesday! If you think you’ve got what it takes to emerge victorious, join the fun from 5-7 pm for Ping pong, checkers, Jenga, foosball and more. 30. Play like a granny… head to The Orlando Shuffle Board Club on the 1st and 3rd Saturdays for free fun. 31. Climb one of Florida’s first “attractions,” the Citrus Tower, built in 1956 on one of the highest hills in Florida’s ridge section. Just $6 to the observation deck. 32. Visit to the Ponce De Leon Inlet Lighthouse and Museum for $6.95. It dates back to 1883! 33. Visit a u-pick farm to pick strawberries, blueberries and more. 34. Stroll along Disney’s Boardwalk, a quarter-mile promenade alongside Crescent Lake, to enjoy free street performers and music. Try your luck at (inexpensive) carnival-style games, watch boats and nosh on treats. 35. Take a gentle boat ride via complimentary water taxis to and from any of Universal’s deluxe hotels. Artegon closed in early 2017. Do you know what day Holy Land has their free admission day?